Description: shrubs, vines, the stem surface is smooth, prickly, whitish-green. Single leaf, oval, pointed, blunt, top, green in colour. Beams, in the inflorescence armpit leaves, petals form a funnel, reddish-green Crown. Fruit round after the old blue-and-black. Form Bean. 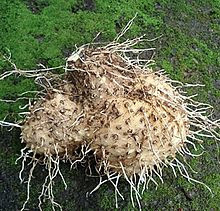 Part use of the medical plant is Rhizome. -Rheumatism (joint pain). -Calluses (external drug).